When Vladimir Putin was appointed prime minister of Russia, very little was known about his background. This former Soviet intelligence agent entered politics in the early 1990s and rose rapidly. By August of 1999, ailing President Boris Yeltsin (1931–) appointed him prime minister. When Yeltsin stepped down in December of 1999, Putin became the acting president of Russia, and he was elected president to serve a full term on March 26, 2000. 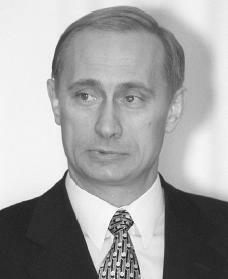 Vladimir Putin was born on October 1, 1952, in Leningrad (now St. Petersburg), Russia. An only child, his father was a foreman in a metal factory and his mother was a homemaker. Putin lived with his parents in an apartment with two other families. Though religion was not permitted in the Soviet Union, the former country which was made up of Russia and other smaller states, his mother secretly had him baptized as an Orthodox Christian. his own in fights thanks to martial arts classes. By the age of sixteen he was a top-ranked expert at sambo, a Russian combination of judo and wrestling. By the time he was a teenager Putin had begun to display the ambition that he later became known for, and he attended a respected high school, School 281, which only accepted students with near-perfect grades. The institution was the only one in Russia to stress chemistry, which was Putin's interest. However, he soon moved toward liberal arts and biology. Putin played handball and worked at the school radio station, where he played music by the Beatles and other Western rock bands. Fascinated with spy movies as a teen, he aspired to work for the KGB, the Russian secret service. At Leningrad State University, Putin graduated from the law department in 1975 but instead of entering the law field right out of school, Putin landed a job with the KGB, the only one in his class of one hundred to be chosen. The branch he was assigned to was responsible for recruiting foreigners who would work to gather information for KGB intelligence. In the early 1980s Putin met and married his wife, Lyudmila, a former teacher of French and English. In 1985 the KGB sent him to Dresden, East Germany, where he lived undercover as Mr. Adamov, the director of the Soviet-German House of Friendship, a social and cultural club. Putin appeared to genuinely enjoy spending time with Germans, unlike many other KGB agents, and respected the German culture. Around the time Putin went to East Germany, Soviet leader Mikhail Gorbachev (1931–) was beginning to introduce economic and social reforms (improvements). Putin was apparently a firm believer in the changes. In 1989 the Berlin Wall, which stood for nearly forty years separating East from West Germany, was torn down and the two united. Though Putin supposedly had known that this was going to happen, he was disappointed that it occurred amid chaos and that the Soviet leadership had not managed it better. In 1990 Putin returned to Leningrad and continued his undercover intelligence work for the KGB. In 1991, just as the Soviet Union was beginning to fall apart, Putin left the KGB with the rank of colonel, in order to get involved in politics. Putin went to work for Anatoly Sobchak, the mayor of St. Petersburg, as an aide and in 1994 became deputy mayor. During Putin's time in city government, he reportedly helped the city build highways, telecommunications, and hotels, all to support foreign investment. Although St. Petersburg never grew to become the financial powerhouse that many had hoped, its fortunes improved as many foreign investors moved in, such as Coca-Cola and Japanese electronics firm NEC. In 1996, when Sobchak lost his mayoral campaign, Putin was offered a job with the victor, but declined out of loyalty. The next year, he was asked to join President Boris Yeltin's "inner circle" as deputy chief administrator of the Kremlin, the building that houses the Russian government. In March of 1999, he was named secretary of the Security Council, a body that advises the president on matters of foreign policy, national security, and military and law enforcement. In August of 1999, after Yeltsin had gone through five prime ministers in seventeen months, he appointed Putin, who many thought was not worthy of succeeding the ill president. For one thing, he had little political experience; for another, his appearance and personality seemed boring. However, Putin increased his appeal among citizens for his role in pursuing the war in Chechnya. In addition to blaming various bombings in Moscow and elsewhere on Chechen terrorists, he also used harsh words in criticizing his enemies. Soon, Putin's popularity ratings began to soar. In December of 1999, Russia held elections for the 450-seat Duma, the lower house of Russia's parliament (governing body). Putin's newly-formed Unity Party came in a close second to the Communists in a stunning showing. Though Putin was not a candidate in this election, he became the obvious front-runner in the upcoming presidential race scheduled for June of 2000. On New Year's Eve in 1999, Yeltsin unexpectedly stepped down as president, naming Putin as acting president. Immediately, Western news media and the U.S. government scrambled to create a profile of the new Russian leader. Due to Putin's secretive background as a KGB agent, there was little information. His history as a spy caused many Westerners and some Russians as well to question whether he should be feared as an enemy of the free world. In Putin's first speech as acting president, he promised, "Freedom of speech, freedom of conscience, freedom of the press, the right to private property—these basic principles of a civilized society will be protected," according to a Newsweek report. In addition, Putin removed several of Yeltsin's loyalists and relatives from his cabinet. On March 26, 2000, Russians elected Putin out of a field of eleven candidates. After his election, Putin's first legislative move was to win approval of the Start II arms reduction treaty from the Duma. The deal, which was negotiated seven years earlier, involved decreasing both the Russian and American nuclear buildup by half. Putin's move on this issue was seen as a positive step in his willingness to develop a better relationship with the United States. In addition, one of Putin's earliest moves involved working with a team of economists to develop a plan to improve the country's economy. On May 7, 2000, Putin was officially sworn in as Russia's second president and its first in a free transfer of power in the nation's eleven-hundred-year history. Putin, a soft-spoken and stone-faced man, keeps his personal life very private. In early 2000, an American publishing company announced that in May it would release an English-language translation of his memoirs, First Person, which was banned from publication in Russia until after the March 26 presidential election. Putin has made great efforts to improve relations with the remaining world powers. In July 2001, Putin met with Chinese President Jiang Zemin (1926–) and the two signed a "friendship treaty" which called for improving trade between China and Russia and improving relations concerning U.S. plans for a missile defense system. Four months later, Putin visited Washington, D.C. to meet with President George W. Bush (1946–) over the defense system. Although they failed to reach a definite agreement, the two leaders did agree to drastically cut the number of nuclear arms in each country. Early in 2002, Putin traveled to Poland and became the first Russian president since 1993 to make this trip. Representatives of the two countries signed agreements involving business, trade, and transportation. Putin, Vladimir. First Person. New York: PublicAffairs, 2000. Shields, Charles J. Vladimir Putin. Philadelphia: Chelsea House, 2002. He was raised as an only child because his two brothers died. One shortly after birth the other got dephtheria after World War Two. Does anyone have quote or sources of quote of Putin's obinion of Barack Obama.